Ken’s at a crossroads. Well, sort of. And there’s more snow ahead..
Fervoured debate. North Sea crude versus West Texas oil. I wasn’t sure what the point of the enthusiastic discussion was. But someone did mention that in the UK gasoline was ten times the cost in the US. Chose to ignore this, resisting the temptation to ask how they spent on health insurance. I was certain I had the better deal. I’d wandered once more into McDonald’s. Felt a bit embarrassed. I’d seen Morgan Spurlock’s documentary Super Size Me. Even got a copy. 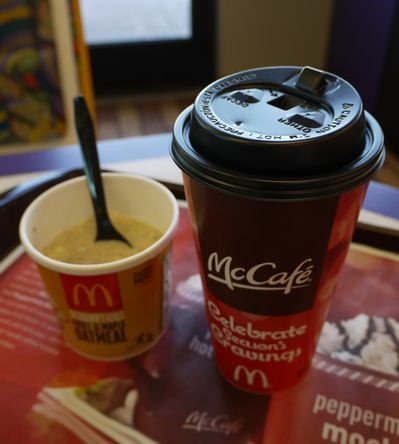 But, in truth, it was the draw of the Scrumptious fruit & maple oatmeal and an Egg McMuffin. Less than 600 calories. And a coffee of course. Also do fairly healthy salads, provide you hold the dressing. But not for breakfast. Comforted my conscience with the knowledge that this was an early morning meeting place for the retired. Tough old boys who’d bettered themselves. They usually bought only coffee. Small. But then one got himself a breakfast sandwich. Sparked a debated on the menu choices, value for money and quality of the food. I think I preferred oil. 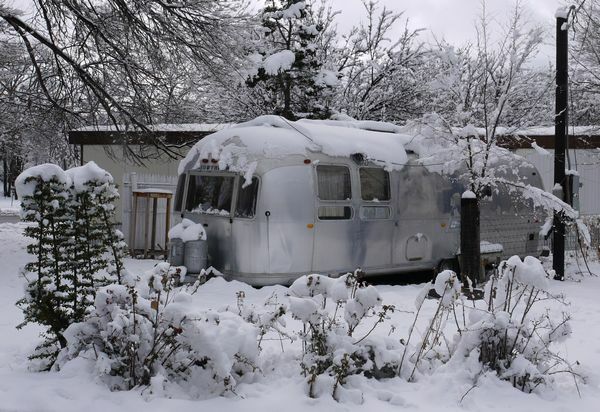 Snowbound in Silver City at a little over six thousand feet. Fighting the white quite fruitless. Instead, refreshing the plan for the journey east to El Paso, Texas. Studying ten day forecasts, looking for a suitable weather window to traverse the 8,230 feet Emory Pass – twice the height of Ben Nevis. And the elevation profiles on my maps, making sure daily targets are challenging, but remain art-of-the-possible. Careful balance required. 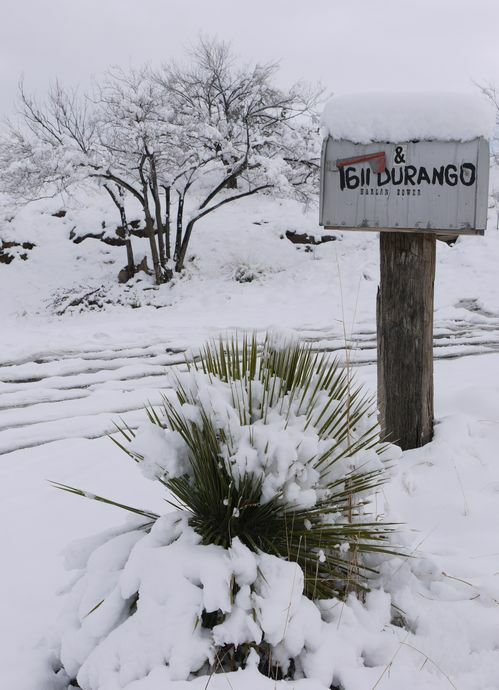 Conditions at eight thousand feet can be very fickle. Best to be cautious, as flexible as possible. Draw on experience of the earlier passes. Expect the unexpected. But need to commit to a plan as I’ve already made arrangements to stay with fellow cyclists in El Paso and beyond. People generally don’t mind change, so long as you let them know in good time. And don’t do it too often. And the plan. 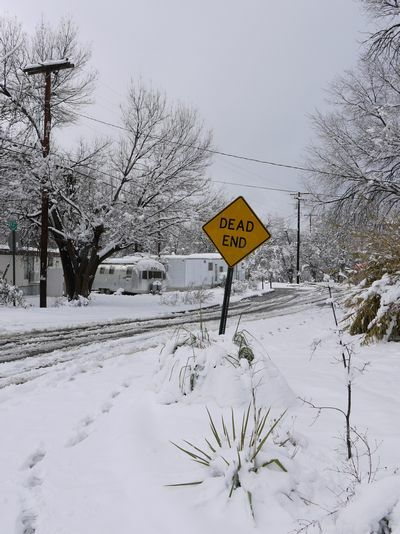 Wait for expected daytime temperatures to rise above freezing. Tyres never good on ice. Reposition thirty or so miles east of Silver City at a US Forestry Service campground at the base of Emory Pass. Complete the traverse the next day – about twenty five miles so if conditions are less than ideal, plenty of time to be cautious. Then downhill for a couple of days to El Paso. He’d asked if it was ok to go onto the roof today. Kept repeating "McDonald’s of Silver City". Said he lived at home with his Mum. Helped looked after her. Roles, I thought, were probably reversed. Despite his enormous build, mostly harmless. Even caring. But his limited intellect often meaning he’d be misunderstood. I returned to nursing a now lukewarm coffee at a corner table. You’d be forgiven for thinking coffee culture is, well, a bit of a luxury on the road. After all, shy of soft drinks in English pubs, it’s a beverage with probably the greatest of mark-ups. Surely best to brew your own. And I do. Whenever I can. Always like to have a small flask of something warming. Great for morale. But you’d be rather missing the point. Popping into a cafe about much more than a hearty drink. It’s the fringe benefits. A break from the elements and an opportunity to reinvigorate waning spirits. Chance to reflect on the day’s progress, to jot down some notes for the blog. Company. It can be very lonely on the road. Flushing toilets and a sink to freshen up. Often free WiFi. Remembering that even the cheapest of coffees are expensive if you over-indulge. Outside it was snowing once more. This was expected. As predicted. Which, I hoped, meant it would also clear up in a few days as forecast. Allowing me to return to the road before becoming gripped by cabin fever.